It is no secret that am a big fan of electrostatic speakers. I have listened to electrostatics — from Quads to MartinLogans — for years. I have owned a pair of ML Montis since 2012 and have never regretted, for a single moment, that vivid, open, sonic spaciousness that an electrostatic projects. It’s tough to listen to anything else. 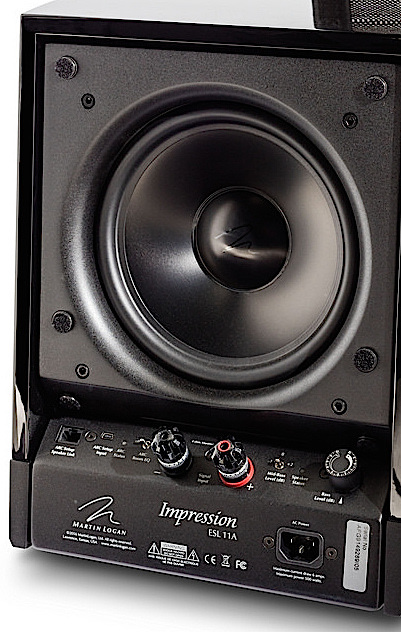 As good as the Montis is for small-to-medium rooms, its replacement, the new $9,995 per-pair Impression ESL-11A, adds more room presence and significantly increases the lower bass, via twin 8-inch, powered woofers. Electrostatic technology has been around for years from such companies as Quad and ML. The design produces audio by electrically charging the steel perforated stator with an audio signal. Because of the low-mass of the electrostatic-panel driver and its dipole radiation properties, the driver’s essential audio character beams a vast stereo image with a fast, accurate tone in the midrange and treble — without multiple drivers and complex crossovers. The ML Impression’s 44-inch panel, combined with powered, twin 8-inch woofers, is an ideal size for most small-to-medium sized listening rooms, and it is marvelously adept at handling Hi-Res music, especially the more detailed sounds of Classical and Jazz. In the early years of electrostatics, bass performance did not match the midrange and treble, but over the years, developments in driver efficiency, powered woofers, etc., have provided bass performance that now precisely matches the speed of the electrostatic driver. The ML Impression is designed for small-to-medium sized rooms and features the renowned ML Curvilinear (CLS) XStat electrostatic transducer panel. 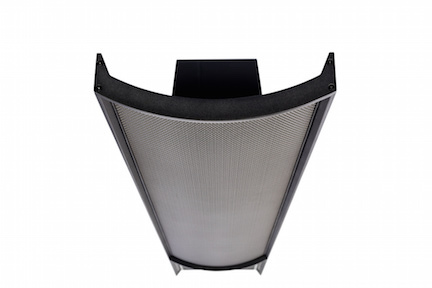 The panel is 44-inches tall by 11-inches wide panel offers a 30 degree horizontal dispersion and frequency response out to 23 kHz. The ML’s XStat novel design includes the MicroPerf stator technology, which allows for almost twice the exposed electrostatic diaphragm surface as a traditional electrostatic panel of the same size. A reinforced electrostatic panel with rigid ClearSpar™ spacers, maintains consistent tension on the vacuum-bonded diaphragm — without obscuring the see-through design. Other panel highlights include the slender, pointed-arrow design of the AirFrame™ Blade construction, which is said to create “a harmonious connection” between the panel and its woofer cabinet. The bass section features two, 8-inch (20.3 cm) cast basket, high-excursion, rigid aluminum cone drivers with extended-throw drive assembly, driven by a 2 x 275 watts/channel (4 ohms), 2 x 550 watts peak Class D amplifier. One woofer is front firing; the other woofer is rear firing. 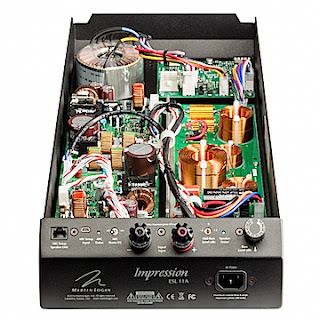 The ML-designed crossover components include custom-wound audio transformer, air core coils, polypropylene capacitors, coupled with a 24-bit, DSP-based preamplifier that controls the woofer amp. The overall frequency response is 29 Hz –23,000 Hz ±3 dB, which is about 5 dB more extended in the bass than the Montis’ single-powered 10-inch driver that was housed in a smaller bass enclosure. The Impression also sports several tone-tailoring options. The onboard bass control on the back panel adds/reduces the under-75 Hz bass up to 10 dB in 1 dB increments. The bass can further be dialed in with a midbass cut/boost/flat switch (+ or - 2 dB). If you really want to be precise, you can let the (sold separately) PC-based Anthem Room Correction (ARC) mmeasures and corrects bass response to match the Impression exactly to your room. It takes a bit of time, a PC and microphone handling skills, but works really well for problematic rooms that have bass nodes that overly reinforce excessive midbass. I have seen (and heard) it dial in “flat” bass in really boomy rooms. The Impression comes in a variety of standard finishes, including gloss white, gloss black and walnut, or custom finishes: rosso fuco, cordoba red, basalt blue and several others. The plain walnut version sent for testing looked fantastic. The Impression weighs almost double the Montis at 90 pounds per speaker, mostly attributable to the much-larger bass box (27-inches from front to back), two woofers and two amplifiers. With spikes the Impression is about 4-inches taller than the Montis and just a little wider. Overall dimensions are: 60.75" × 11.9" × 27.4" (inches). The rear panel was relatively easy to access with the trio of switches/knob, a RJ45 connector for ARC, and the WBT-0703Cu nextgen™ 5-way binding posts. The cable connectors feature a filigree-signal conductor made from gold plated, nickel free, non-ferromagnetic, pure copper for high conductivity, and it is fully insulated. The design is claimed to be free from eddy current effects. I placed the Impression pair in my audiophile test room about six feet from the back wall and two feet from the side walls. Overall separation of the speakers was eight feet. I toed them in a few degrees and located the listening position eight feet from the speakers. With the walls not that far away from each Impression, I predicted a rise in midbass response, and I was correct. Playing bass test tones and measuring with my RTA, the meter showed a 3 dB rise from 80 to 120 Hz. Moving the speakers further from the side walls reduced the room-aided bass boost, but I lost my speaker separation. I opted for the onboard tone controls. Using the midbass cut -2B switch position and a few dB of the under-75 Hz bass control, I achieved a pretty flat sounding, low-end response in my room — without having to move them. I later used the Anthem Room Correction system to see how flat I could make the bass since its software-set control was more precise. In fact, ARC made it flat within 2 dB, based on the measurements, but my usage of the onboard controls also gave me a good balance between the bass and treble. 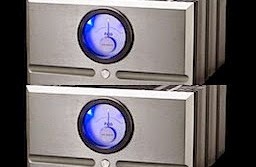 With the speakers properly set up, I opted for a wide array of amplifiers for the review. 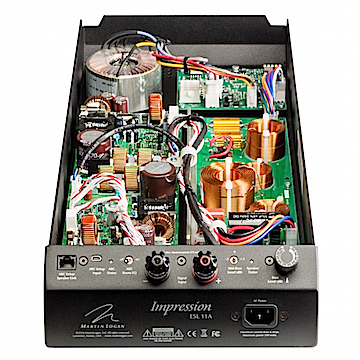 The list included Benchmark AHB2 bipolar output (very low noise), Rogue Audio Medusa Class D/tube hybrid, an amp that I use extensively with the Montis; Pass Labs X350.8 (MOSFET); Bryston 14B-SST-II (bipolar output), the recently reviewed Pass INT-60 MOSFET integrated, and even the $800 integrated 30-watt, Class D TEAC AI-503. 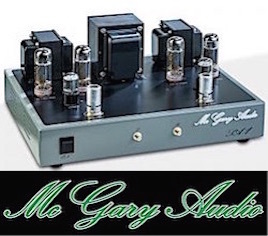 Preamplifiers included the Rogue Audio RP-5 tube preamp, Coda High Current solid state, and an assortment of DAC/preamps including Benchmark DAC3-HGC, Mytek Manhattan II, and an Oppo Sonica. Digital players included: an Oppo UDP-205, Asus tablet with USB Audio Player Pro (bit perfect mode), and an Apple Macbook Pro using Audirvana Plus. I also played some vinyl using the ClearAudio Emotion turntable with a Benz MC cartridge, utilizing the tube phono stage of the Rogue RP-5. Speaker and line cables were provided by Wireworld. And all the components were plugged into the AC with Essential Sound Products Reference II cables and power strip, including the Impressions. Having owned and played music through the Montis hundreds of times, as well as many years of monitoring through various generations of electrostatics, I expected a lot from the new electrostatic tandem: that wide dispersion with tons of depth that envelops the plane of the speakers. The electrostat’s large surface and its dipole radiation of the audio conveys more “air”, which enhances the sonic realism of musical instruments. 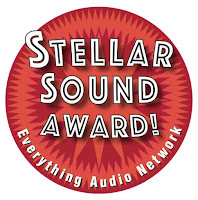 Solo instruments, such as piano, classical guitar and drum cymbals are lifelike through good electrostatic speakers. The sound is addictive; when I go back to point source driver speakers, it takes me a few days to adjust to the difference. 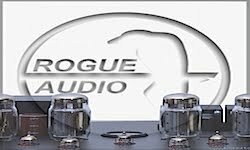 Based on experience with the Montis, I first paired up the Impressions with the Rogue Audio Medusa hybrid tube/Class D, 200-wpc amplifier that is always a good match with electrostatics. My first music demo via the Impression was, of course, the Warren Bernhardt - So Real SACD. The airy drum cymbals, closed mic’d stereo piano and juicy bass line were mixed live in the studio by Tom Jung. 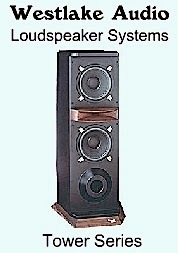 The recording’s openness is well showcased by electrostatic speakers. On the cuts "Autumn Leaves" and the title track "So Real," the horizontal “space” between the instruments evokes a realness that is hard to ignore. The piano’s upper-register notes resonate from the room with such completeness that you can clearly hear the edges of reverb tails. The brushed drum cymbal attack has that live, bristle-to-brass percussive tone that is about as real as I have ever heard from electronics and loudspeakers. Because of the Impression’s height, the listener gets a bigger sense of the soundstage above and below the normal speaker plane. 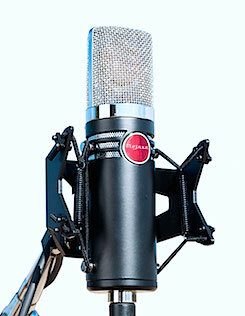 Recorded room sound, emerges as larger sonic snapshot of the original recording space and microphone setup. Listening to my favorite cello recording, the Mercury Living Presence SACD of Janos Starker — Complete Bach Solo Cello Suites, the solo cello was magnified much larger than your average point source speaker. 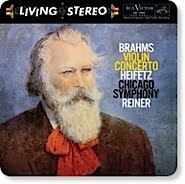 The stereo recording’s width and remarkable depth extended beyond the speakers. Not only could you hear the cello’s full roundness and seductive string vibrancy, but all the incidental sounds! Switching to the Pass X350.8 amp, the piano’s rich middle frequencies emerge with a prominence you don’t often get from other speaker designs. The Steinway’s sound is so complete you can hear the low-level audio nuances of the wood — just like you do when listening to a piano in a real room. Man, do these speakers sound good! The tonal balance of the Impression was perfectly matched. I never noticed any tilt or significant reduction in the overall bass/midrange/treble balance. The two-eight inch woofers, have plenty of kick down to about 30 Hz (-3 db in my room). And thanks to the onboard fast pair of eights and Class D amps, the bass was super tight. Recordings with full drum kits emerge more prominently from the Impression than the Montis. There is a sense of a more room-filling low end. I never thought the Montis lacked bass, but the Impressions bigger box volume and extra woofer moves more air. The orchestra, of course, was equal to the task. Full, lush and a huge stereo image. Cranking it up a bit showcased the ML’s (and Pass’) smooth factor. Clean as the proverbial whistle. One area where an electrostatic speaker really excels, is lack of sibilance in vocal reproduction. As with the Montis, female voice sounds incredibly clean and accurate via the Impressions — without the excessive “s” you get from many traditional tweeters. One area where an electrostatic speaker really excels is lack of excessive sibilance in vocal reproduction. On the 2003 Tuck and Patti — “With Love” CD, the 2010 Diane Krall — Glad Rag Doll (24/96 download) and the 24/192 Linda Ronstadt — Heart Like A Wheel, the sibilance was nil. The voices were all amazingly accurate. On the 2003 Tuck and Patti - With Love CD, the 2010 Diane Krall — Glad Rag Doll (24/96 download) and the 24/192 Linda Ronstadt — Heart Like A Wheel, the sibilance was nil, allowing me to concentrate on the beauty of the female vocal range. You don't have just a 4 or 5 inch midrange and a tweeter handling the voice, you have the entire panel. It makes a difference. The rich tenderness and power of Linda Ronstadt’s version of “Heart Like A Wheel” is simply gorgeous. On recording after recording using any of the previously mentioned amplifiers, the Impression handled everything, I threw at it. Rock and Roll, Folk, Country, Bluegrass, etc. The speakers did all the music justice. In my room, the heavy rock and dense pop, does not sound as good cranked up too high with any speaker. And that included the Impression. The rear reflections, combined with the front’s increased projection with extra volume, sounds too smeared when you push the volume levels to the high 90 dB’s. I like a maximum peak in the low 90 dB range. Because of the panel’s increased radiation surface, however, lower decibel levels don’t seem so low with the Impressions. To punctuate what a pleasure it was to review the MartinLogan Impression (as it was with the Montis), I must say there were zero problems or criticisms with the speaker and its operation with many pieces of gear. They are heavier than the Montis, and I needed two people to move and unbox, but there were no issues. MartinLogan tells me that the panels are very reliable, with very few returns for repair or replacement. I can attest to that with the Montis, no problems at all — in almost six years of heavy use. The only critique I had, was related to the Anthem Room Correction. ARC is one of the best set up systems for tailoring bass via DSP, but its lack of Apple Computer OS compatibility bothers me. I extensively use Mac, and I do not have a dual-boot Mac version that is bootable in Windows. Thus, I had to borrow a dedicated Windows PC to just test the ARC. I should mention that MartinLogan makes several audiophile-class electrostatic speakers. I have listened to many of the current line, including the larger $25,000 per pair Renaissance and the flagship Neolith ($80,000, gulp!) that I reviewed in 2014. They all have that electrostatic sound, but are made in different sizes and different bass driver arrangements to project their superb sound into variably sized rooms. 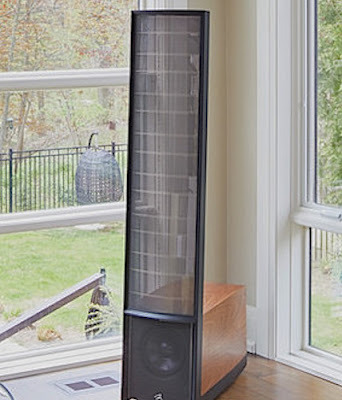 The MartinLogan Impression shows how the evolution path of electrostatic speakers has improved the technology to the point where it is nearly flawless in its performance. They now have low bass that matches the speed of the panel’s immaculately, focused midrange/treble, and they can be played much louder than the original ‘stats. The big selling point, however, is that gorgeous spread of sound. That space impression and the ability to convey the finer details of music — it all helps deliver on the promise of musical realism through the speaker. The Impression is a perfect replacement for the Montis. A bit more of the sonic image, combined with more bass power/low-end extension. Plus, it looks great, yet still costs the same price. The Impression’s 44-inch panel is an ideal size for most small-to-medium sized listening rooms, and it is marvelously adept at handling hi-res music, especially the more detailed sounds of Classical and Jazz. But regardless of what music you like, if you are seriously into electrostatic speakers, the MartinLogan Impression is one you should consider. And if you don’t know the lure of an electrostatic, you should try it to find out what you have not been hearing. You may never listen to any other kind of speaker again. 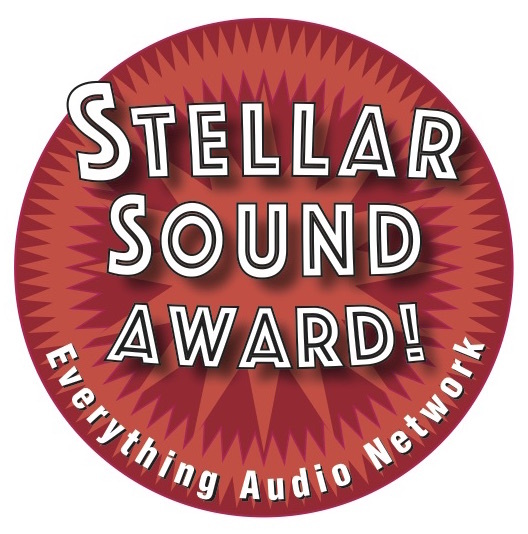 With my highest confidence, the MartinLogan Impression ESL-11A receives our Everything Audio Network Stellar Sound Award and a prominent nod to the Everything Audio Network’s Speaker of The Year list. I guess I liked it.